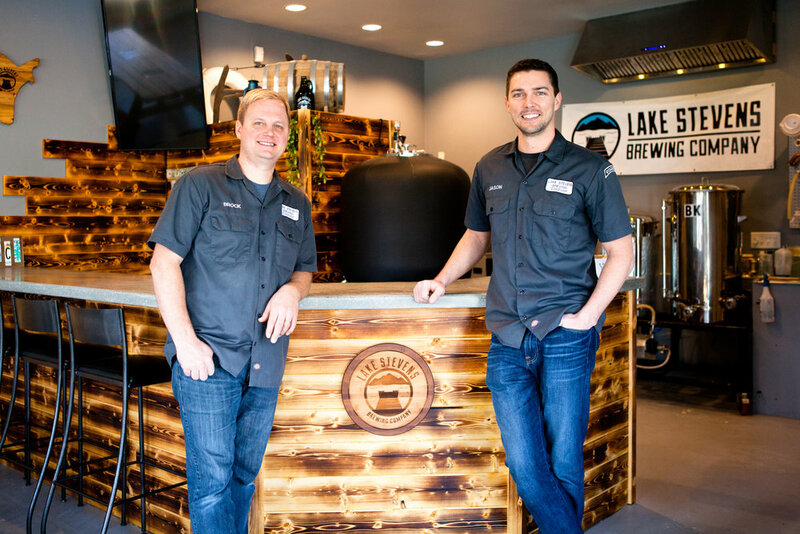 Located in historic downtown Lake Stevens, we’re proud to have established the first brewery in the city of Lake Stevens. We’ve strived to create a small and welcoming taproom and brewhouse with a family and dog-friendly environment. You’ll see locals ordering food from one of many local restaurants to enjoy with our many beer selections and rotating hard cider. Like many businesses, we were founded as an idea in a garage between 3 would-be brewers and a pair of old brewpots. If only our brews had been less inviting, we might still be brewing weekly in that garage. But we soon realized a substantial following of thirsty neighbors and local growler-seekers alike. The garage simply couldn’t support the growth. A wife with a plan of taking back her garage space certainly helped the persuasion. So after five years of brewing together, we began looking for a commercial brewhouse location. Our local support, labor outreach and Kickstarter funding sent us on our way with no looking back. Jason Parzyk is a Lake Stevens native, owner/brewer and engineer of the many brewing systems we’ve used over the years. Jason recently married Elisabeth, and you can see the two of them working together on weekends and during our infamous Trivia Nights. When these newly weds aren’t at the brewery, you’ll find them skydiving, wing walking and working on their huge yard. Brock Duerr, is a father of two, owner/brewer, and married to his AMAZING wife Andrea, the brewery backbone and admin-extraordinaire. Brock recently retired from his general contracting career to be work at the brewery fulltime. if hes not brewing or kegging beer, he’s out hiking and camping with his family. Cullen Thompson, “Flat Head” was the real workhorse behind our brewing operation. Shortly after opening our brewhouse, Cullen tragically passed away in a car accident. He will never be forgotten. We brew on in his memory.